The name Ringling is synonymous with the “Greatest Show on Earth”. The name conjures up images of a caravan of trucks and trailers carrying exotic animals and unique individuals. Every kid in town wanted a ticket to that show. The lights, the animals, the daring feats and sometimes freakish side shows had a special allure. Every store in town had a large colorful poster advertising the event. The kids saved their money to buy tickets and if lucky, some popcorn. It is this same name that was the founder and builder of the Museum of Art. John and Mable Ringling had a love for art. After purchasing prime property in Sarasota, Florida, the couple built an unbelievable, magnificent mansion named Ca' d'Zan, meaning House of John. This mansion was five stories tall and had over 40 rooms. The Ringling's traveled the world looking for circus acts and also purchased works of art that were eventually displayed in the Ringling's 21 gallery museum. There was a period of decline after John's death. But during the struggle, A. Everett 'Chick' Austin, Jr. was hired as the Director of the Art Museum. He opened the first Circus Museum utilizing various artifacts and memorabilia from the circus. He also constructed a separate theater building that was appointed with original decor from a theater located in Venice, Italy. The settling of the Ringling's estate took decades. Private donors helped to keep the estate barely running. Finally, as recent as 2000, the state of Florida handed over governance of the museum to Florida State University. The University invested a considerable amount of money to restore the original buildings and built four more: a Visitor Pavilion; The Circus Museum Tibbals Learning Center; David F. Bolger Playspace; and the Center for Asian Art. The new buildings, combined with the four historic buildings - Ca' d'Zan; Museum of Art; Circus Museum; and the Historic Asolo Theater - make up The Ringling. For all the excitement and thrill the Ringling Circus brought to town, it can now be said The Ringling truly is "the greatest show on earth" preserving artworks from the world over and a tribute to the great circus era. Dubbed the State Art Museum of Florida, this 31-gallery Museum of Art is the premier destination in Sarasota. Artwork and antiquities, many handpicked by the Ringling's, are on display for the public's enjoyment. In fact the original 21 galleries are being systematically being renovated in order to showcase these marvelous works in new, inspiring ways. Aside from enjoying the many galleries, the Museum also offers special events. Check their website for current details. Permanent collection tours are available daily. Tickets are $10 each at the admission desk. Private tours can also be arranged. Prices start at $100; reservations must be made two weeks in advance. The private home of John and Mable Ringling would be something directly out of the “palace floor plan magazine" if one existed. Designed in the Venetian Gothic style, this mansion has every beautiful thing imaginable. Large ornate rooms filled with priceless treasures and elaborate furnishings. Tours of the magnificent home are available at the admission desk. The Ringling Museum of the American Circus was established by A. Everett "Chick" Austin Jr. The artifacts include wardrobes of the performers and a wide variety of circus memorabilia including props, carts, parade wagons, and so much more. Recently, the railcar, Wisconsin, has been fully restored and is available at the museum. This railcar was home to the Ringling's as they traveled with the circus. Entrance to the circus museum is included in the admission ticket to The Ringling. The Bayfront Gardens occupy 66 acres adjacent to the Gulf of Mexico. Stunning views amongst splendid plantings of trees, flowers and shrubs! The garden is divided into several distinct areas. Mable had a love for roses, and this garden was one of her first works. The restoration of this garden includes roses introduced between 1867 and 2002. The splendid garden is home to Tree Roses, Hybrid Tea Roses, Floribundas, Grandifloras, miniature roses and Old Garden roses. Mable would be proud of this garden - 1200 plants to enjoy their beauty and their overpowering scents. This garden started out with plants Mable received as gifts. Now the garden is the final resting place of John and Mable Ringling and Ida Ringling North, John's sister. Modeled after the German and Italian gardens of the 18th and 19th centuries, there are a variety of dwarf stone statues that came from Italy. 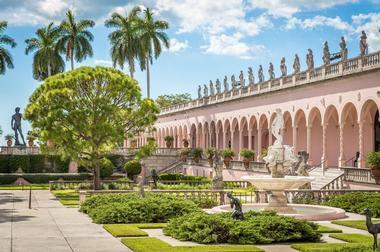 Located next to the Visitor Pavilion, the garden's dwarf figures continue to charm and amuse guests of The Ringling. Mable had a passion for exotic trees. The 66-acre garden is appointed throughout with a varied collection of trees including Banyan, Shaving Brush, Tiger Claw, Monkey Puzzle, Ear, Rainbow Eucalyptus and several types of bamboo. A large promenade was built in 2010 to connect Ca' d'Zan to the Millennium Tree Trail. The trail is sidelined by many trees including oak, holly, citrus and magnolia. 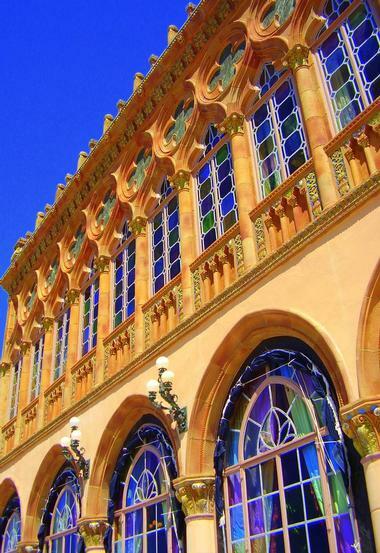 Known as the birthplace of performing art in Florida, the theater dates back to the 15th century and the Queen of Cyprus! Decades later the theater was built in the great hall of the queen's palace. Advance forward, the theater was eventually dismantled and stored in Venice during WWII. Ultimately it was purchased for the Museum of Art and moved to Florida and reconstructed. It has been fully restored and is now housed in the Visitor Pavilion. The theater is U-shaped and has three tiers of boxes. The Asolo hosts regular performances of live plays and music. The Education Center houses the Ringling Art Library. It contains thousands of volumes on art in every form. The collection is open for public use, but cannot be circulated. The Education Center hosts a variety of events including story time on selected Fridays; a book club, and an educators program on Saturdays. The Center is also open for classroom events as well. The Ringling is located just off of Hwy. 41 and Ringling Plaza. Parking is available on the Florida State University campus near the Center for Performing Arts. If you loved the circus, you are sure to enjoy a visit to The Ringling. 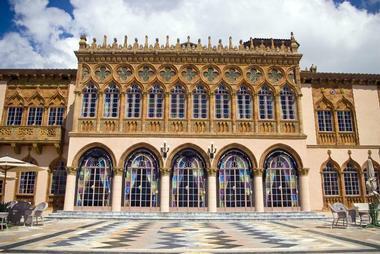 Located in Sarasota and adjacent to Florida State University, The Ringling is a showpiece of days gone by. 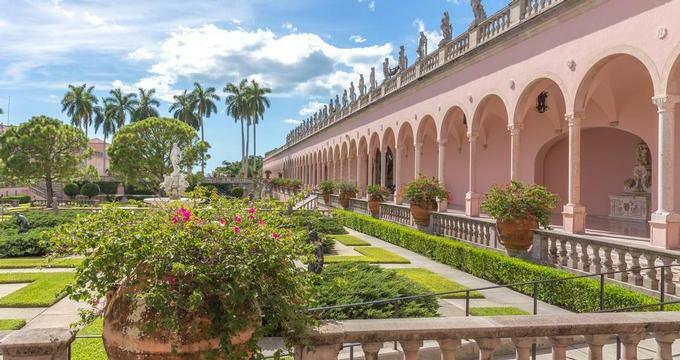 With collections of some of the world's greatest artwork, circus memorabilia, and gardens, this is a must see attraction for those visiting the Sarasota area. There are three dining options at The Ringling: Muse at The Ringling; The Banyan Cafe; and The Museum Cafe. Muse is a full service restaurant serving lunch and dinner with a full bar selection. The menu includes sophisticated foods with an international panache. Reservations are recommended. The Banyan Cafe is an outdoor eatery that serves up light meals such as salads, sandwiches, burgers and hotdogs. The Museum Cafe is a coffee house located upstairs in the Visitors Pavilion. They serve a variety of pastries along with your favorite coffee or tea. 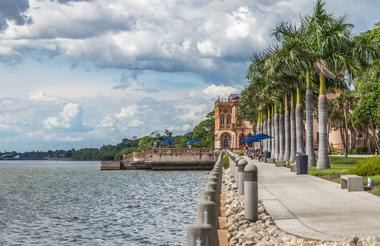 Picnics are allowed in designated on the grounds of The Ringling. Make it a full day with your family or friends and enjoy the gardens, the waterfront, promenade and more. The Museum Store has a variety of circus-themed items - perfect for gifts or your own souvenir. The store features jewelry, books, games, ornaments, music and much more. The store is located at the Visitor Pavilion. The Circus Store featuring posters, wall art, books, t-shirts, jewelry and more has something for everyone. Take home a circus keepsake. The Ringling offers the perfect backdrop for your wedding. The gardens, Ca' d'Zan terrace and many other lovely spots would be perfect for you to say "I do". Corporate events such as meetings, receptions, picnics, tours, family fun days, whatever your corporate need The Ringling offers some great venues from which to choose.